*Packaging Excellence Awards for Uflex*Innovation to create value added differentiation is the common thread running through all flexible packaging solutions that Uflex engineers for its global clientele spread across over 140 countries. It is this innovation by the flexible packaging bellwether that has won it several accolades over the years. 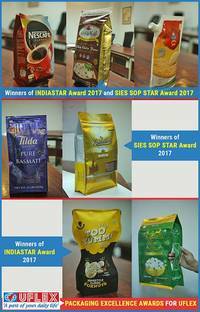 Recently INDIASTAR Awards 2017 and SIES SOP STAR Awards 2017 were announced to recognize excellence in packaging innovation and development. The following packaging products manufactured by Uflex have made it to the *Hall of Fame*! While INDIASTAR Awards are conferred by the famous Indian Institute of Packaging (IIP), SIES SCHOOL OF PACKAGING STAR AWARDS as the name suggests are presented by the renowned institution SIES that is credited for churning out some of the finest packaging professionals in the country. Uflex Limited is also a part of the D&B Global Database and winner of various prestigious national and international awards for its products’ excellence. Uflex offers technologically superior packaging solutions for a wide variety of products such as snack foods, candy and confectionery, sugar, rice & other cereals, beverages, tea & coffee, dessert mixes, noodles, wheat flour, soaps and detergents, shampoos & conditioners, vegetable oil, spices, marinades & pastes, cheese & dairy products, frozen food, seafood, meat, anti-fog, pet food, pharmaceuticals, contraceptives, garden fertilizers and plant nutrients, motor oil and lubricants, automotive and engineering components etc.